- Derived from 3rd generation packaging system with a shRNA included for maximum yield. - Compatible with both 2nd and 3rd generation lentivectors. Figure 1. The carton shows how the LentiMax™ packaging system works. 1. 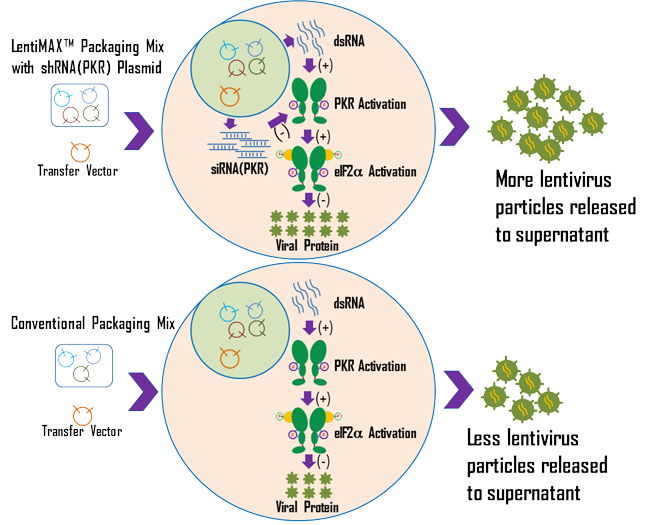 Lentivirus packaging via Lenti.MAX™ packaging system. 2. Lentivirus purification via PEG precipitation followed by ultra-centrifugation. 3. Recombinant lentivirus titration via p24 ELISA. Required Material: Lentivector (>50 µg) carrying your gene of interests (GOI) in transfection grade. Deliverables: >0.25 mL (2x125 µL) at >10^9 TU/mL* in vivo grade** of lentiviral vector. We offer customized service in medium scale, please request a quote with us today.